Another Beautiful Day in Paradise. The weather was almost perfect. The temperature was in the low 70s, the sky was clear blue but we did have a little breeze out of the ENE. Bladers/Bicyclers Breeze, Wilma & Jim F, Dave A, Rick P & Ginnie S, Bill H, Dee T, Sandy R, Carol J, John L, Pete K & Olivia M, Dan C, Laura P, Sara D, Kathy H, Linda C, Glennis W, Jeff B, Amie H, Paula C and Bruce M came. Jeff & John pretty much led us on the basic Snell Isle/Shore Acres route but took us to a few extra little places. Thanks Jeff & John. Well Glennis did take us by her house. We also stopped at Kim & Joels but just missed them. We had 4 bladers and 19 bicyclers. 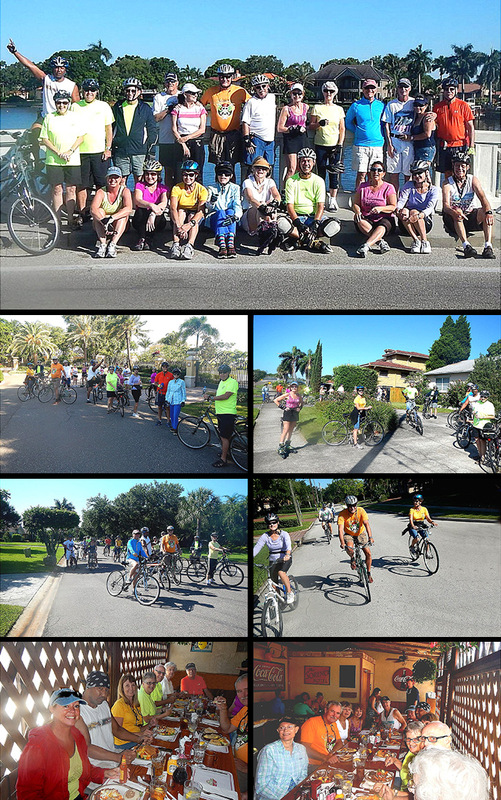 All of the group did the 10.8 mile skate/bicycle. We Brunched at Harveys as planned. We got seated in just a few minutes at a big long table. Harveys was pretty busy so it took them a while to start waiting on us. Eventually the coffee started flowing freely and the service picked up. It took us about 1 hour and 15 minutes to get in and out. However the food was good as usual and we rated it a 9.5.